An adventure to the Mount Brown hut had been on my list since I read this Backpacker magazine article last December. 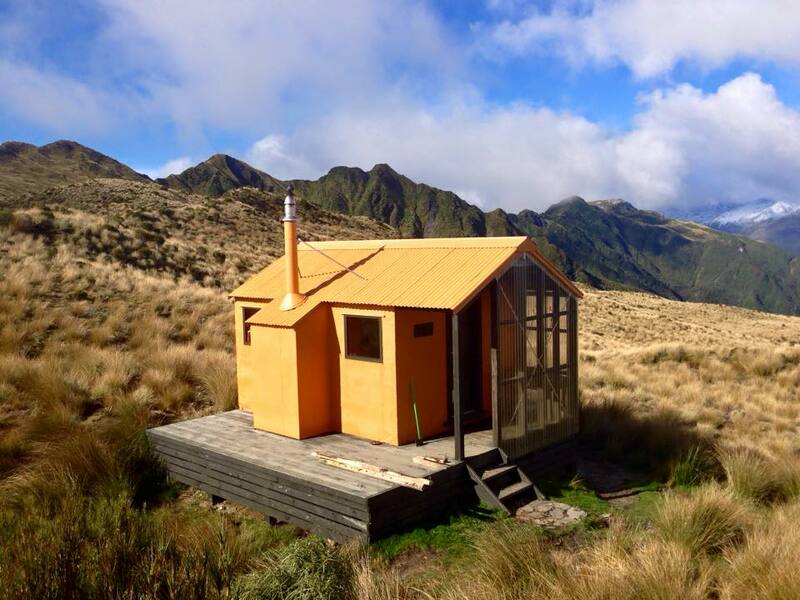 The article linked to my new favorite website, www.remotehuts.co.nz, and I spent days dreaming about remote backcountry huts like Mount Brown. Fast forward a few months to when my friend Crystal took this stunning photo of a little yellow shack looking out at the ocean with another sea of peaks at its back. I knew I had to get there before the end of tramping season. The Mount Brown hut sits on the west coast, an area notorious for heavy rain, so our timing was key—and we nailed it in a narrow window between the end of a mean storm and my then-adventure buddy’s last day on the South Island. The trail to Mount Brown starts off of Lake Kaniere outside Hokitika. We slept in the car at the trailhead, rain pounding on the roof, with our fingers crossed that the weather forecast for sunny skies the next day would be accurate (forecasts rarely are in New Zealand). When I finally fell asleep, I dreamed that my beloved station wagon was washed away in a flood of mud. We woke to implausible sunshine and opened the car doors to COLD. Luckily (or not so luckily? ), since this area is also known for mountains that rise out of nothing and trails that go straight up them, we warmed up pretty quickly once we shouldered our packs. I have to admit that I love those tracks that force you to scale 2-meter rootwads and get creative with hand and footholds. I don’t love trails that force you to skirt ankle-deep mud—or stumble into it, which I usually do. Mount Brown has both of those—you know, just for balance. Two and a half hours of rootwad climbing and mud-hopping later, we crested the rise to a view of mountains covered in new snow, frosty snowgrass, and the yellow hut of my dreams perched on a cliff overlooking the sea. Mount Brown is a 4-bunk community-maintained hut with a little coal stove for keeping warm on icy days like these. Unfortunately for us at the tail end of tramping season, there was no coal left. The thermometer in the hut read 4 degrees C (a balmy 39 Fahrenheit, for my US readers.) If we were going to stay there for the night, we were going to have to get creative. Our search revealed an abundance of wet two by fours peppered with nails under the hut, conveniently left from its rebuild years ago, in addition to a rusty saw that hadn’t been sharpened in just as long. While Stu got to work with the saw, I attempted to get some embers started with our wet kindling and anything dry that might ignite, including playing cards, toilet paper, and pages from the hut intentions book. No dice. An hour of sawing and failed kindling endeavors later, we discovered a bottle of turpentine hiding under the hut. Jackpot. We finally started a tiny fire with toilet paper stuffed into a toilet paper roll soaked in turpentine. We patted ourselves on the back for our resourcefulness and kicked back to warm our icy toes and fingers as the storm closed back in. In the late afternoon, a man opened the door to the tiny hut. His face was weathered, and he wore an old woolen tunic tied with rawhide reminiscent of Lord of the Rings. His gators had seen better days, and his massive hiking boots were covered in mud. His Kiwi accent was gruff, and he was clearly annoyed to find the hut occupied. “What are you two doing here? This hut’s not in Lonely Planet now, is it?” he said disgustedly. He removed his wool jersey to reveal a dirty wifebeater, a barrel chest, and sinewy muscles that gave his vaguely menacing comments some seriousness. His partner walked in and merrily introduced herself, and we exhaled. Unimpressed with our fire-starting bravado and our pile of wet wood, Andrew walked back out into the hailstorm and returned 30 minutes later with armloads of branches, magically gathered above the bushline from who knows where. He commenced to build up our tiny fire into roaring flames. Stereotypical badass Kiwi. Later that night, playing cards with Andrew and Joke by candlelight (after he decided to let the trespassing Americans stay instead of kicking us out into the storm), Andrew said he’d helped to build the Mount Brown hut and many other community-maintained huts on the South Island. 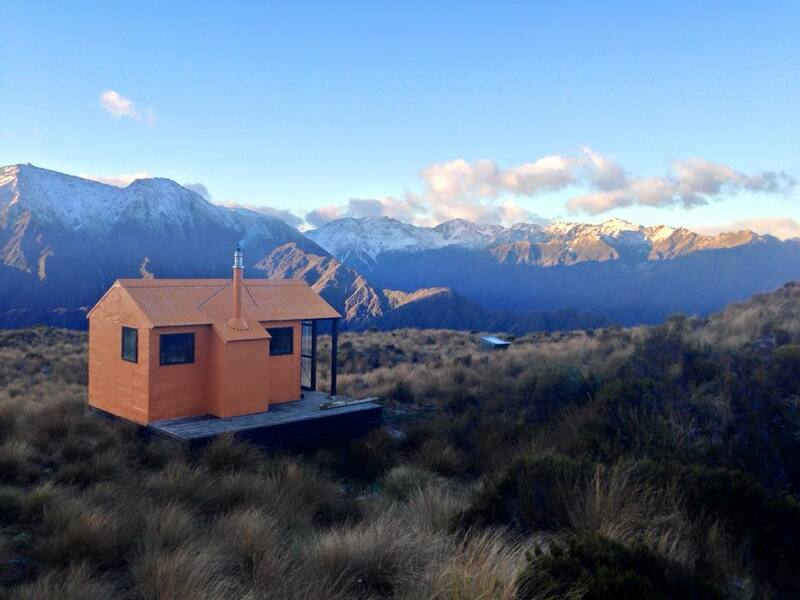 He let slip that he started a website for these huts: remotehuts.co.nz. He was, in fact, the local guide featured in the Backpacker magazine article that inspired me to go tramping in New Zealand. He was characteristically unmoved with his fame, and somewhat amused by my starstruck questions. As the clouds parted in the cold night to let out the stars and the winds howled to gale force outside, Andrew assured us that his hut would withstand any storm. We fell asleep to a crackling fire in a blessedly warm room and soft snoring from one legendary badass Kiwi.